Delta faucets are used in both commercial and residential installations. Delta's line of sink faucets features both single and dual handles. as well as pull-out washer types and built-in sprayers. But no matter what type of Delta faucet you have, if it becomes clogged, it's not going to do much work. Depending on what the problem is, there are a number of ways that you can clear a clogged Delta faucet. The supply hoses bring water from the sink to your Delta faucet. These hoses, in most cases, are flexible. However, they can sometimes become kinked and clog up the line. Material inside the water supply, such as silt and rust, can also clog up the supply hoses. In order to unclog or un-kink the supply hose, turn off the water supply valve then unscrew the hose couplings Straighten out the hose if it is kinked or blow through the line with a garden hose. Replace the hose and secure the couplings. If the main water line that leads up to the house is clogged, then your Delta faucet won't work. Check the other water fixtures in the house to see if they are operating or not. If they aren't, the problem is with your main water supply line. Call your city or county municipal water works and let them know about the problem or see if they are working on it. One of the main causes for why a Delta faucet might be clogged is due to objects trapped inside the aerator. The aerator is a series of screens placed just inside the faucet lip. These screens break up the water as it exits the faucet, mixing it with air to create a fuller stream of water. To fix the aerator, unscrew the outlet on the Delta faucet and remove the aerator screens. Rinse them off underneath a running faucet then replace. Similar to the aerator, dirt and other foreign objects can become trapped in the body of the faucet. Fix this by removing the faucet body and flushing it out with a stream of water. 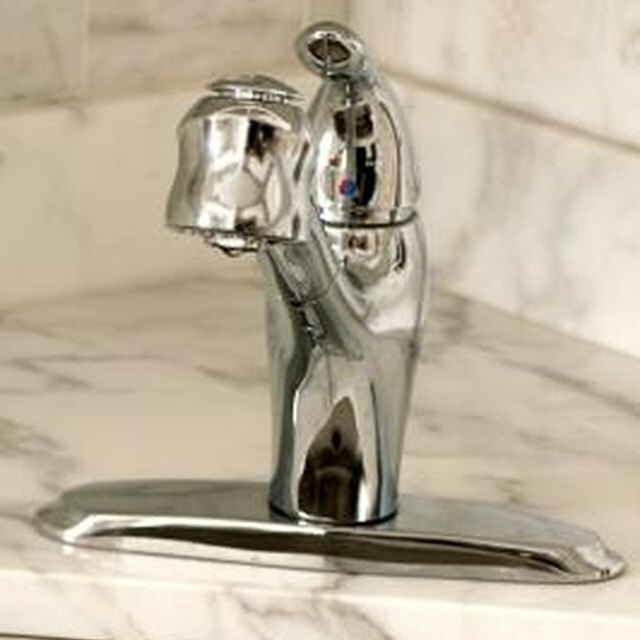 On some Delta kitchen faucets you can remove the faucet head without having to remove the entire faucet body.